Boonville, MO (7-24-18) – CMMG has announced the release of a new line of AR pistols and short-barreled rifles (SBR’s) chambered in FN 5.7x28mm. Available in 5-inch barreled BANSHEE and 8-inch barreled PSB configurations, each model in the new Mk57 GUARD line is fed from FN 5.7 pistol magazines and uses CMMG’s patent-pending Radial Delayed Blowback operating system. “The 5.7 is an intriguing round that is perhaps best known for its relatively lightweight bullet design and impressive velocities. From an engineering perspective, we were excited to pair the 5.7 with our Radial Delayed Blowback system. 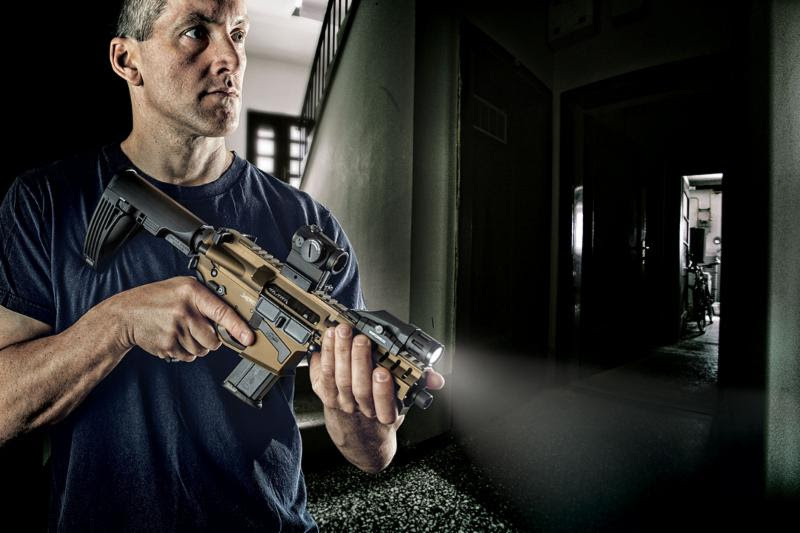 I think it’s safe to say that this combination makes the Mk57 one of the lightest recoiling pistol caliber carbines on the market,” said Chris Reinkemeyer, CEO of CMMG. At the heart of the Mk57 is CMMG’s Radial Delayed Blowback operating system designed to minimize felt recoil. It features rotating bolt that requires the recoil impulse of a round being fired in order to unlock. As each round is fired, a portion of the rearward force is exhausted in unlocking this bolt prior to driving the carrier rearward and cycling the action. 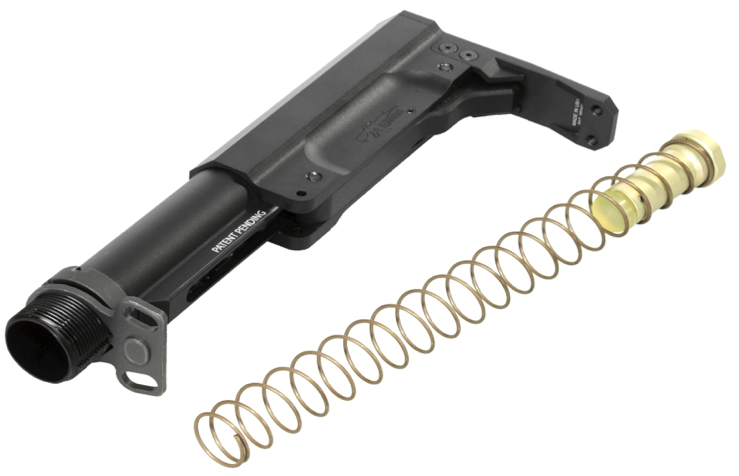 With less rearward force to compensate for, CMMG is able to use a lighter carrier and buffer than a standard blowback design would allow, thus reducing the overall reciprocating mass. CMMG will also offer a separate lightweight buffer for use with subsonic ammunition. To overcome the reduced backpressure with subsonic loads, the lightweight buffer can help ensure that the bolt locks back after firing the last round. The FN 5.7×28 was designed and introduced by FN Herstal with the intention of replacing the 9mm for military and law enforcement usage. While the caliber has been adopted by several agencies throughout the world, its real success came with its entry into the civilian market in the early 2000’s. 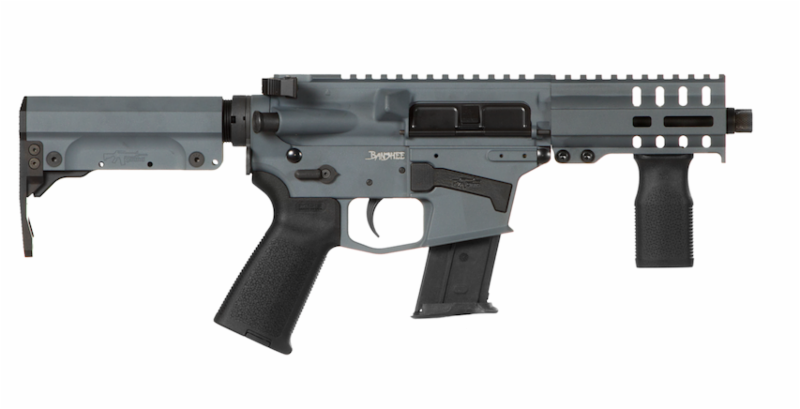 The BANSHEE in 5.7×28 has a 5-inch barrel and comes as either an SBR or an AR pistol. 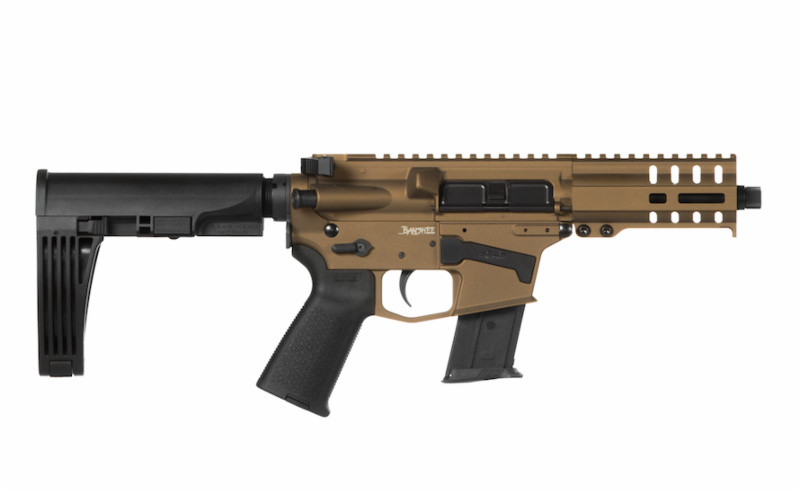 The SBR version is sold with Magpul Moe vertical foregrip and features CMMG’s new RipStock. The Ripstock allows users to quickly deploy the stock to an extended position without having to actuate a release lever. It also has five set-screw positions that allow users to customize the length of extension to the best fit. The AR pistol versions come with a Gear Head Works Tailhook Mod2 brace that allows users to easily extend/collapse the brace with the press of a button. Distinguishing features of the BANSHEE also include the addition of CMMG’s new ambidextrous charging handle and RML4 M-LOK hand guard. A CMMG Premier Cerakote finish (11 different colors to choose from) is included standard with each BANSHEE. 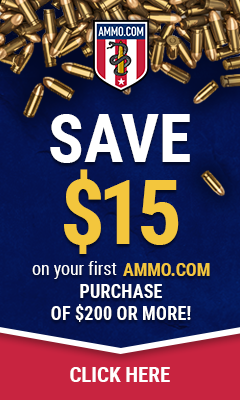 It ships with one 20-round ProMag magazine and is compatible with FN Five-SeveN pistol magazines. The Mk57 PSB Pistol includes an 8-inch barrel and a KAK Shockwave Brace. It also sports a CMMG RML7 M-LOK hand guard and CMMG A2 Compensator. 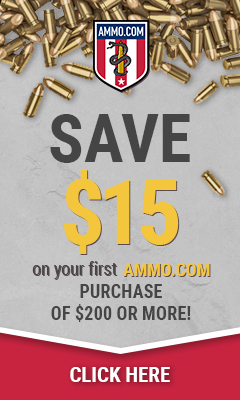 It ships with one 20-round ProMag magazine and is compatible with FN Five-SeveN pistol magazines. The Mk57 Pistol includes an 8-inch barrel and sports a CMMG RML7 M-LOK hand guard and CMMG A2 Compensator. It ships with one 20-round ProMag magazine and is compatible with FN Five-SeveN pistol magazines. Included on each BANSHEE SBR, CMMG’s RipStock is a revolutionary, retractable buttstock engineered for lightning-fast deployment to your personal setting. With Fastback Technology, simply pull straight back to extend the stock. No locking tabs to bind. P3 Technology (Personal Position Preset) allows users to adjust the indexing screw and to set your own preset. MSRP is $199.95. CMMG’s new ambidextrous charging handle is included on each model of BANSHEE and is designed to improve the operation of your AR. Gross motor skill operation, gloved operation, or just trying to get ahold of your latch with an optic mounted are greatly improved by our larger latch design. The ambidextrous latch allows for easy operation no matter which hand you use to charge the weapon. Sizes available for your AR15, AR10, Mk47 and MkW platforms. Made of 7075 Aluminum and backed by our CMMG Lifetime Quality Guarantee. MSRP’s range from $79.95 to $99.95. CMMG, Inc. will guarantee its products against defects in material or workmanship. CMMG, Inc. will repair, replace or substitute part(s) (at CMMG, Inc. discretion) at no charge to the customer if a defect of material or workmanship is found. All service work must be carried out by CMMG, Inc.
CMMG began in central Missouri in 2002 and quickly developed into a full-time business because of its group of knowledgeable and passionate firearms enthusiasts committed to quality and service. Its reputation was built on attention to detail, cutting edge innovation and the superior craftsmanship that comes from sourcing all their own parts. By offering high quality AR rifles, parts and accessories, CMMG’s commitment to top-quality products and professional service is as deep today as it was when it began.